I'd like to use the "Print" extension but it defaults to manual feed and NOT the paper tray. Can someone provide advice on how to get this working? While the Print action works with plain text and PDF documents, it does not work with Microsoft Word documents. When I use Word on a PC at work, I can batch print several documents at once. On my Mac, while I can always drag the documents to the printer application icon in the dock, I must still click on Print in the print dialogue for every document I want to print. Is there a way for the Print action to work with Microsoft Word documents or, if not, could a separate plugin/action be created? Yesterday I downloaded the trial/demo of DropZone. I tried to move a file on my desktop to my Documents folder; it ended up in my Home folder and not in my Documents folder. I then downloaded the Print function from Extend DropZone page, installed it, but when I tried to print a document nothing printed although Dropzone said it was printing. DropZone is a great concept but it hasn't worked for me yet. If I'm doing something wrong I'd like to know. I would certainly buy it, but not until these issues are resolved. I figured out what was wrong. I went to my print queue and changed the default printer from "last printer used" to "Canon MP620". Now I'm able to print. I just started experimenting with Dropzone and I am having a problem with Print. When I dropped a Word document (.docx) on it, it completely went crazy and started printing many pages with one or two lines of gibberish on each one. I then tried printing a .txt file and the printout came out really ugly with very large fonts and each paragraph as one stream with no regard to word boundaries. Special characters (such as characters with umlaut) does not show up either. Is there some configuration that I need to do? The Dropzone Print destination doesn't currently support printing of Word Documents or changing print settings. I'm working on a better version of the Print destination. I whipped up the current one in a few minutes to just print images, text and PDFs but it has been a lot more popular than I expected so I am now improving it. I've just updated the print destination. I got another question on the print extension. Is there a way to configure the print options? I would be glad to hearing from you. The print destination doesn't support advanced printing options like you describe. I started going down the road of adding more configuration and realized that there are literally thousands of options users may want to configure when printing and this falls way outside the scope of what Dropzone is designed for. The print destination is really only for a super quick and dirty way to print a document without having to open it first. e.g. I want this PDF printed, real quick. If you're trying to use it for tasks beyond this then you're missing the point of the destination. While I the problem the issue of supporting thousands of printer options, there are a few central options that should be addressed. The most relevant of these would be the option to choose the paper size. Currently, I can't seem to persuade the Print extension to print A4 sized pages (The most common print-size on earth) only Letter sized pages (the most common print size in North America). Could you add support for paper size? Or does it already exist and I've blundered by it blindly? My goal with creating the Print destination was to provide a 'quick and dirty' way to print a file without opening the application it was created in. There are major downsides to doing this, such as the fact that you can't set printer settings such as layout, copies etc. Also I had to do a bit of a hack to make Word docs print - they are rendered using the Quicklook engine before printing so the formatting will not always be correct. The destination is actually often a poor choice for printing. I'm afraid no further print options are coming for this destination. I have just bought Dropzone 2 in macheist bundle 4. Interesting app with great future I think. I have already used it with imageshack and desktop-wallpaper with success. I have also tested with 'print' plug-in but it does not work correctly. you can see that the error says 'no pages found' but that is not true. The same error occurs with different PDFs I have tried. does it works for anyone? Is it just PDFs that it fails for or other file types also? Try dragging a jpg onto the print destination and see if that works. Paste me the output from the debug console - maybe that will shed some light. I just tried the print destination myself with a PDF and it worked fine so it may be something specific about your setup. OK, thanks. Unfortunately I'm still not sure what the problem is. I've modified the destination script slightly to provide more debug output. Can you please download http://shipsomecode.com/misc/Print.dropzone.zip - unzip it and then double click the Print.dropzone file to install it (it should replace your existing print extension). 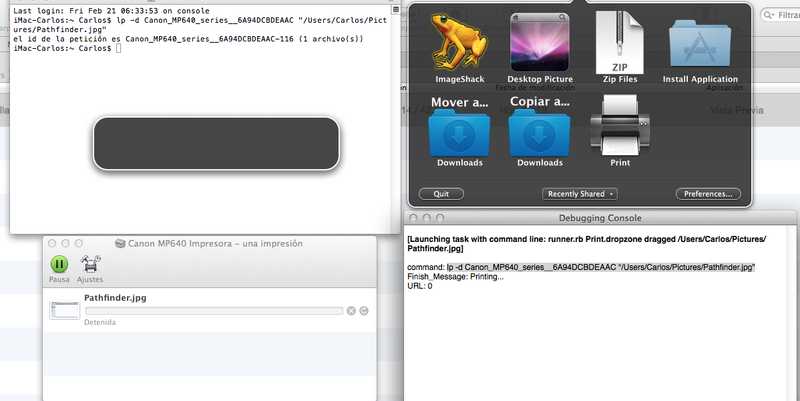 Then try to print a jpg again and look at the debug console. It still won't print but in the debugging output there should be a line that says something like command: lp -d <printer name> "Pathfinder.jpg"
Please open a terminal and paste everything after the 'command:' part into Terminal (it is in Applications under the Utilities folder) and see if it prints then or paste me any output from the lp command. Did it actually print when you ran the lp command on the Pathfinder jpg on the command line (the bit you did in the screenshot in the top left)? Dropzone is just calling the lp command (and I see it says 'Detained' when you do this) so it looks like the printer might be paused or something. Is printing to that printer from other apps working? when I ran the command in the terminal, happens exactly the same, nothing is printed.